Recreation in the Mt. 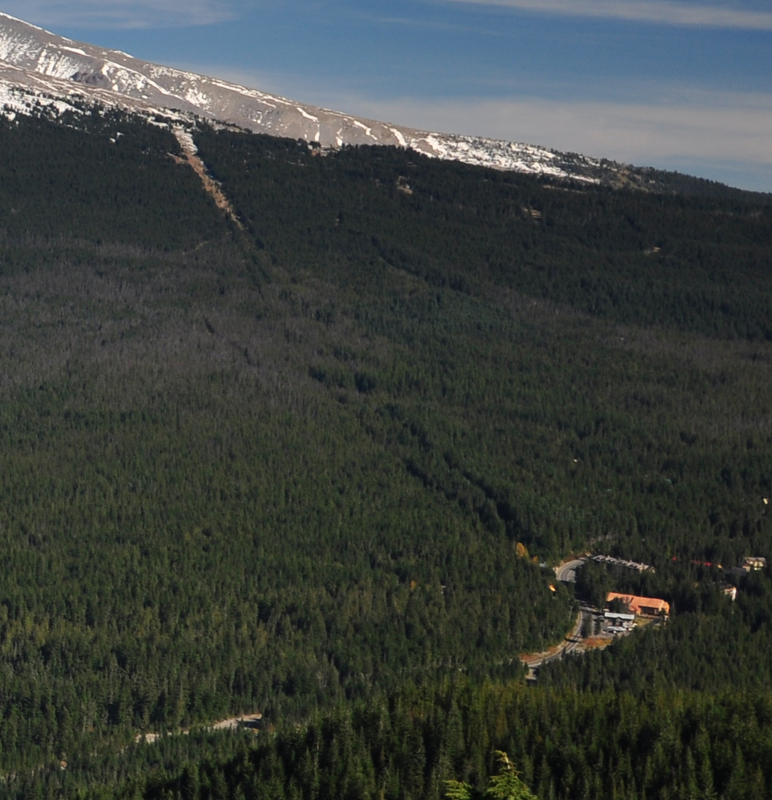 Hood National Forest increased after the end of World War II. 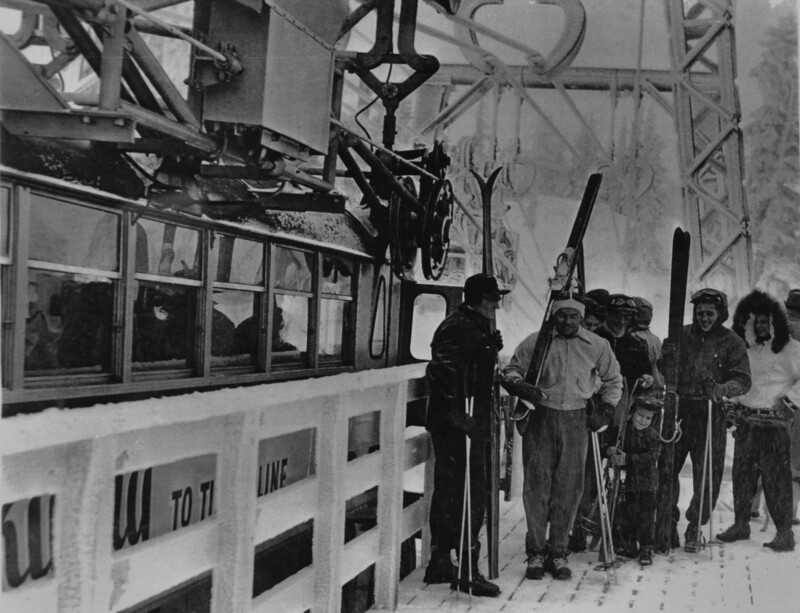 Skiing was a popular wintertime activity and Dr. J. Otto George envisioned a tramway connecting two popular skiing destinations: Government Camp and Timberline Lodge, which was 2,200′ higher up the mountain. He formed a corporation called the Mt. Hood Aerial Transportation and started looking for investors. In 1948 after he’d finally gathered enough money to get started and he’d gotten a conditional use permit to build on Forest Service land, clearing and logging of the 3.2-mile right-of-way began. After the right-of-way was cleared concrete was poured and the 38 steel towers were installed, along with 25 miles of 1.5-inch diameter cables. 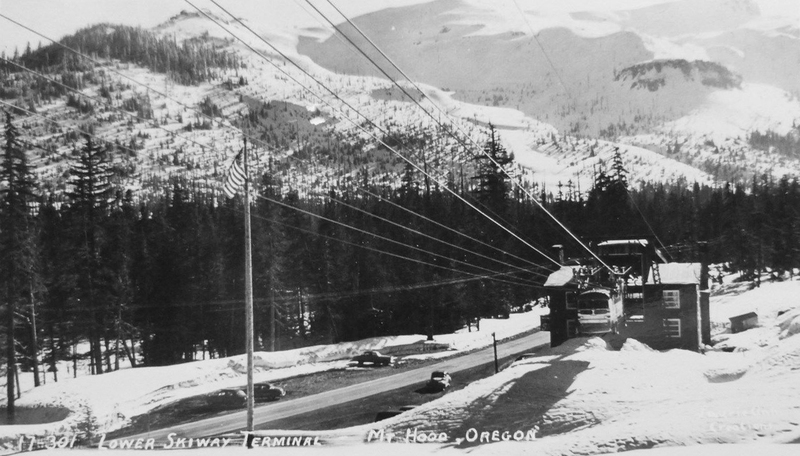 Most mountain tramways are pulled by a moving cable. Not this one. The cars were suspended by sheaves from the 1.5-inch suspension cables. Two 1.75-inch cables wound around three-foot drive sheaves on the sides of the car. The cars pulled themselves up the mountain on the traction cables which were anchored at both ends. After more than two years of construction, the tram was tentatively scheduled to opened in April 1950, but it wasn’t ready until early the following year. In advance of the grand opening, a promotional run on January 3, 1951 carried newsmen, radio announcers, and cameramen up the mountain. 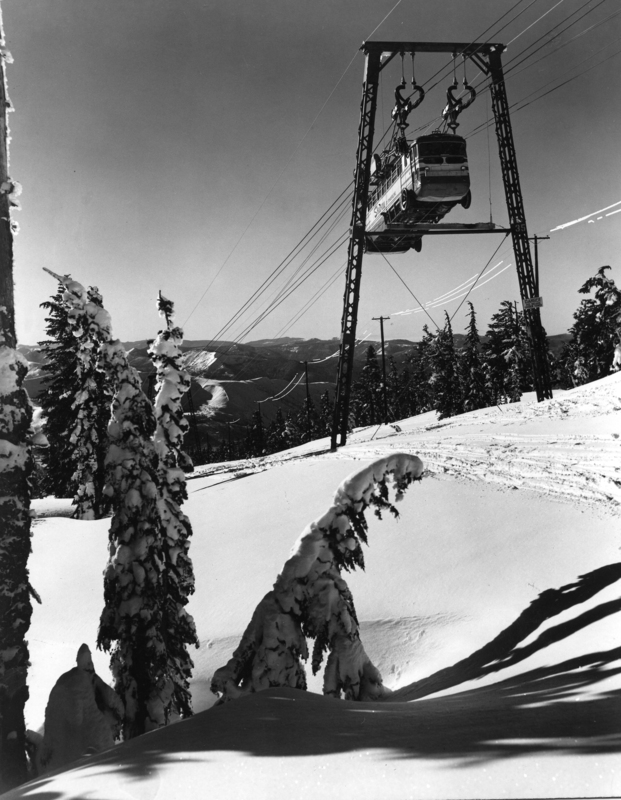 The January 4, 1951 Oregonian article – which called the tram the “Timberline Trolley” – reported that the trip took 20 minutes. Although the interior of the tram greatly resembled a city bus, the article said “the cloudliner makes considerably more noise than a wheeled bus. The clanking and grinding of its cables make conversation aboard impossible.” One reporter – who had been a WWII Air Corps officer – described riding in the back of the tram car “as similar to to the tail gunner’s spot in a B-17 bomber.” Riding in the front was like “riding the front end to a helicopter.” Finally, after more than three and a half years, on February 2 the newspaper reported that the tram would begin operating the next day. One-way fare was 75 cents; round-trip was $1.50. The lower terminal in Government Camp had a restaurant and snack bar operated by Thomas Johnson and his wife, who operated the restaurant at Multnomah Falls Lodge. The terminal also had a gift shop, ski shop, and guest lounge. The tram entered the terminal on the building’s third floor where the loading/unloading platforms were located. The lower terminal can be seen at far right. 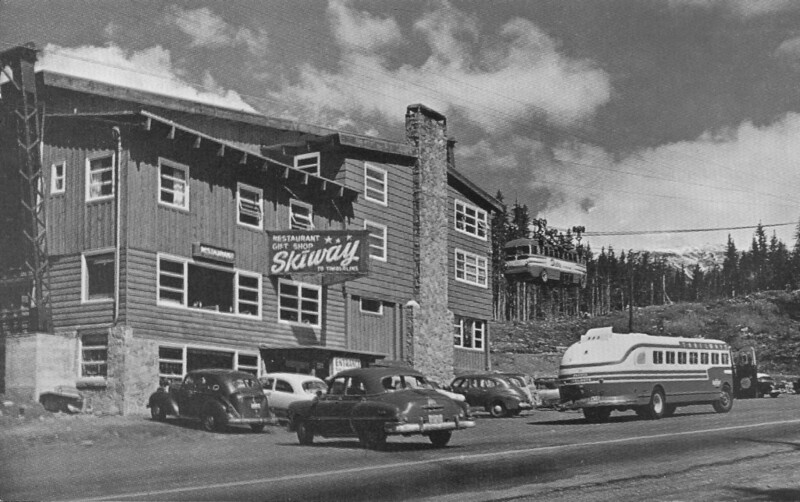 The lower terminal of the Skiway tram. At Timberline Lodge the tram had no upper terminal building. Passengers had to load and unload from an open-air platform. The loading platform at Timberline Lodge. Improvements were planned almost immediately. Future plans included a bigger 500-space parking area, a new wing at the lower terminal to provide facilities for private parties, construction of an upper terminal building, and installing floodlights along the trail beneath the tram for night skiing and hiking. At a stockholders meeting in November 1952, it was suggested that the self-propelled buses be eliminated and be replaced by smaller, lighter coaches. 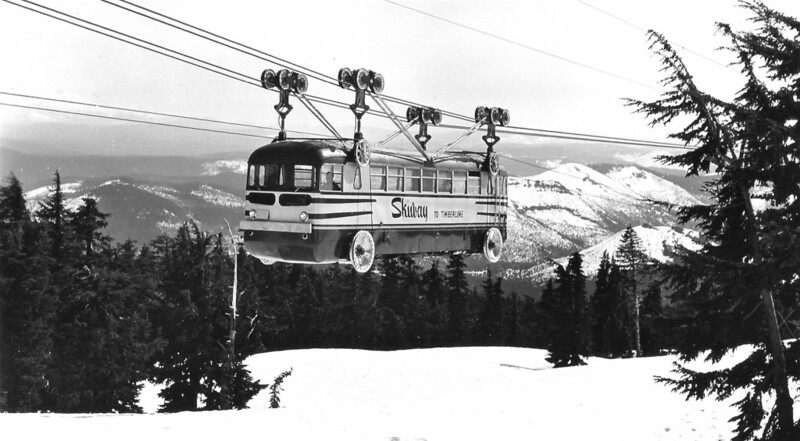 The power plant would be on the ground (rather in each coach) so it would operate more like a ski lift does. The changes would increase the frequency of runs from once an hour to once ever 20 minutes. Nothing ever came of this plan, although the possibility of removing the buses and installing six-person gondolas was mentioned in the newspaper again in June 1956, at which point the two big self-propelled coaches had sat idle for the past six months due to dwindling ridership. Fare revenues had been $38,000 in 1952 but were down to $18,000 by 1954. The trams were slow and they only moved 72 passengers an hour. 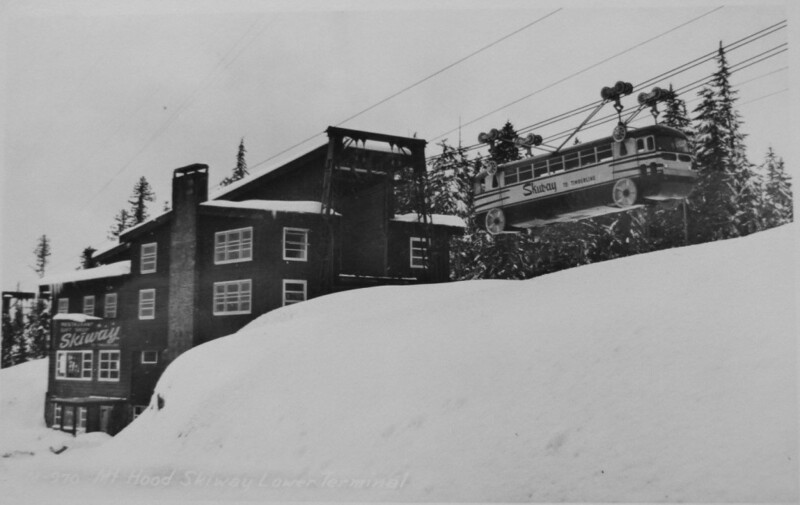 Plus, the new road to Timberline Lodge had opened the same year as the tram and when driving conditions were favorable the drive was a good 10 minutes less than the tram ride. The tram never reopened. During the summer of 1960 a salvage company removed the towers. One of the buses was scrapped and the other was bought by a logger in Seaside who used it as a toolshed. In January 1961 Franz Herrmann assumed management of the lower terminal. The Oregonian reported that he planned to “convert the building into a showplace” with plans to “remodel the lounge to provide a Swiss atmosphere. 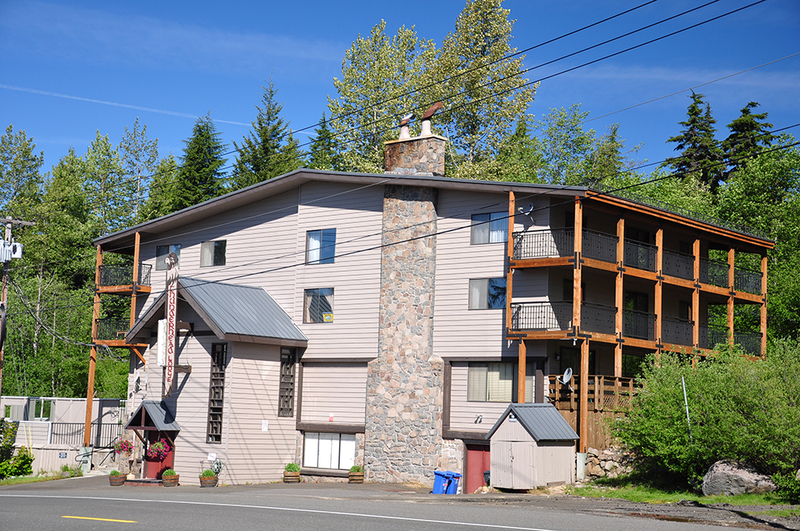 Within the next year or two he’ll convert the tram car loading area into 20 hotel rooms.” The lower terminal reopened in December 1962 as the Thunderhead Lodge with 21 private rooms, a coffee shop, deluxe dining room, and swimming pool. The entire ground floor was converted into a lounge and dance floor. On September 30, 1979 a small notice appeared in the Oregonian’s classified section that read: “Thunderhead Lodge on Mt. Hood at Government Camp being converted to 18 1 & 2 bdrm condominiums.” Today the condo building still stands and still bears the name Thunderhead Lodge. The old path of the tramway between Government Camp and Timberline Lodge.